Why do you always cheat on your diet, even when you have a good plan? Why do you never stick to your workout routine? This 2-part post will help to answer these questions – but more importantly, it’ll give you strategies to help you stick with your diet and workout routine, especially if you’re first starting out or have hit a rut. In their book Switch, Chip and Dan Heath propose that in order for changes to work and be maintained you must influence three main areas. 1 – The Rider -This is is the logical part of your brain. This is the part of your brain that sets goals and then makes plans to achieve those goals. This is where your long-term decision making is made. It’s also the part of the brain that allows you to get mad at yourself for not following through on your plans. 2 – The Elephant – This is the more emotional part of your brain. If you frighten the elephant (if your try to change too much at once), then the elephant won’t go along with the change. In order for a successful change to occur, you have to both appease the Rider and the Elephant. Both The Rider and The Elephant are really descriptions of the dual system of decision-making. In a previous post I described this system as the “Angel and Devil” system of decision making. The ‘Angel’ is where higher order, long-term planning and decisions are made. The ‘Devil’ is the impulsiveness, the here and now, that gets you to throw out your plans and follow your desires in the moment. But there’s a third part to these terms that rarely gets mentioned, but can be essential with making a successful change. 3 – The Path – The path is really the environment. 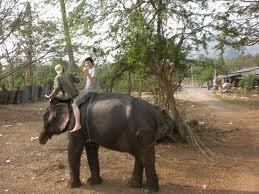 For example, say you start a journey (start a change) and have both your Rider and Elephant on board for the change. Every time you go to get water for the elephant though, the lake doesn’t have enough water. As it turns out, the lake has start to run dry and both the Rider and Elephant are constantly thirsty. After a while, you start seeking a new lake to get water. The problem is, every time you go to get that water, it takes you so far away from the path that you’re supposed to be on that the journey starts to become a nuisance. This happens often with any change, especially when it comes to making changes to our bodies. We emotionally want to make changes – we’re fed up with our bodies and decide to go on a diet and start exercising. We make a plan to get to the gym 5 days a week and decide to do a program that has worked for others in similar situations. The first week, we do well and our self-control carries us through. The second week, you start to succumb to temptation. There’s lots of “junk food” in your house, because you “need” it there for your spouse’s sweet tooth. Since the food is there and you feel hungry, you decide to have one cookie. One cookie turns into a whole package of cookies in front of the TV. Instead of feeling bad about eating all of the cookies, cognitive dissonance starts to kick in. You start to justify the eating by saying, “I deserved it, because I’ve been so good on my diet.” If that was true and then you got back on board with your diet, “the cookie incident” wouldn’t have been a problem. On the other hand, since you never felt even a modicum of guilt about “the cookie incident”, another conversation starts in your head. You start to say, “this diet is too hard. I need a whole weekend of free eating.” And so that’s what you do, you don’t follow your diet at all, you don’t go to the gym and your mind is at ease. But where did the whole failure of your journey start? Did it start with your emotional reasoning? No – you truly wanted to change. Did it start with your planning? A little – but you had your diet and exercise planned. For the most part, the failure of your resolve started with “The Path,” your environment. Anyone’s that ever succeeded on a diet knows that they either need to start with a plan for “free” meals or not have the foods around that are going to cause themselves to lose that self-control. With that said, what’s the best ways to engage, not only your logical (the rider) and emotional (the elephant) modes of motivation, but how to you manipulate your environment (the path) in order to keep that motivation going? 1 – Find an emotional reason for your change. This should be self-explanatory. The problem is we typically start planning a change before we find a deep desire to change. Without that deep desire for change any plan will ultimately falter in the face of more emotional reasons to quit exercising or dieting. You know, like fatigue or your friends who invite you out to eat at the Cheesecake Factory. My first post ever was about this concept. To this day, I think it’s still one of the most important components between those who stick to exercise and those who give up on it. They’re either striving towards something with all they have or they’re fighting against demons in their heads – with exercise as a medium for those battles. Either way, those emotional reasons are omni-present in those who succeed in seeing the changes they want from their bodies. Tomorrow I’ll be back with the last 2 steps that help influence your motivation for the better, along with 6 strategies for setting up your environment for success. If you have any questions about this post or about personal training in Hoboken, please contact me via John@PersonalResultsTraining.com.